After searching the net and reviewing and writing about tech products all day I like to unwind at the end of the day and play my guitar. During some of my searching, I found a few cool guitar gadgets that I'm sure many guitar players would like. I thought I would make a few reviews and share with you what's out there in cool guitar accessories. If you have a guitar player in your life to get a gift for, your sure to be a winner with one of these products. So here we go with our Cool Gadgets For Guitar Players Review. The Thalia Capo was inspired by an 8-year-old girl named Thalia. She is a big Taylor Swift fan and noticed that Taylor used a standard capo on her beautiful Hawaiian Koa guitar. She mentioned that Taylor should have a better capo to her inventor and guitar player father and that set him into action to develop the Thalia Capo. He wanted it to be beautiful but also he wanted to make a better more versatile capo that worked better and fit any guitar. With a very successful crowdfunding campaign in 2014, they seemed to have accomplished both goals. They now have a wide selection of stunning looking capos that work exceptionally well and has received very positive feedback from users. It has "reverse action" design that makes it easy to apply with just the fretting hand using the same pinching action as a barre chord. This makes it very easy to move will playing a song. 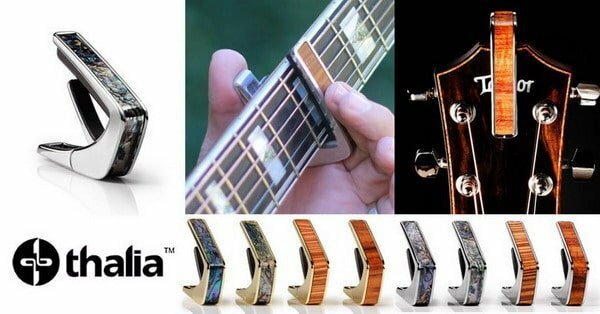 Every Thalia Capo comes with 14 interchangeable fret pads that will fit any guitar. The price of Thalia Capo may turn you off but they are quality made with exotic woods and will last a lifetime. They also make a very nice wooden picks that are worth checking out. See my full Thalia Capo review coming soon. This newly developed and successfully crowdfunded guitar gadget is a new innovative way to tune your guitar automatically. Download the mobile app that comes pre-set with 8 alternate tunings and the ability to custom tune your guitar. Have you ever broken a sting trying to do an alternate tuning? The roadie will help prevent this. The Roadie unit will adjust string slightly sharp or flat if you have a tune that needs a little variation. Handy if you like to follow James Taylor’s advice on tuning. James says that certain strings ring flat and other strings ring sharp. Bass strings when played hard will ring sharp and the B string needs to be flat. The following tuning will give you a more accurate tuning when playing, especially when using a capo. This custom tuning can be easily done using the Roadie. The Roadie is three times more accurate than the human ear. The Roadie is simple to use simply put it on a string peg strum the string and the roadie will automatically tune that string. The Roadie works great in a quiet setting but not very well in a noisy environment. They do have noise cancellation mode to help with that. They also provide an adaptor to plug into an electric guitar via your smartphone but this could be a problem for an acoustic guitar if it does not have any pickups. Create and store a profile for all of your instruments, and sync it across devices. Refine your advanced tuning options, such as reference pitch and capo tuning. Choose from a multitude of alternate tunings for your instrument, or create your own custom tunings. Access music news, our latest updates, and tips on how to improve your playing. Keep track of your tuning stats and strings' quality and know when to change them. Use the manual tuner included on the app as a chromatic tuner when Roadie is not with you. Create custom instruments such as a dulcimer or a santour or anything else with geared pegs. Customize the speed and accuracy of your Roadie. Bonus future that I think is really great is the Roadie will wind and unwind your strings to make changing your strings quick and easy. 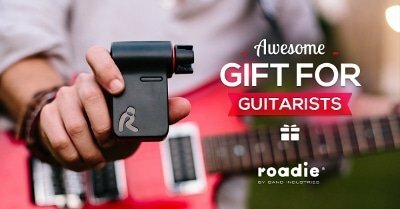 The Roadie could be a great addition to any guitar player’s arsenal for around $100 this unit can make tuning your guitar fast and fun. If you’re a bass player they offer the Roadie Bass specifically for tuning bass guitars. The Roadie is presently available for around $100 from Amazon and directly from the manufacturer. You may want to wait for the new Roadie 2 to come out. It will be available soon with a few upgrades like a onboard screen and vibration sensors instead of a microphone. An optional App or the Roadie 2 can be used as a standalone. The new Roadie 2 comes in at around $140. A guitar Midi controller designed for your Ipad. The Jamstik Plus is a very portable instrument that can easily be taken anywhere. Coming in at only 16 inches long this Midi controller will work with many apps. It may look like a toy but it is much more than that. The Jamstik Plus is their latest version, updated with Bluetooth connectivity unlike its predicator that only used WiFi. The Jamstik Plus is not the only Midi controller on the market but one of the few that uses real strings and frets for a real guitar feel. Infrared lights from inside the fretboard read the strings and activate an infrared network inside. It’s a handy instrument for a musician on the go. I think the main reason someone would want to purchase this guitar is to learn how to play guitar and for creating music with Garageband, Logic Pro X or a number of other computer-based studio programs. As for learning guitar, I think the Jamstik Plus would be good for the absolute beginner stage of playing guitar. It is a convenient way to get a little extra practice on playing basic cords and get active finger feedback on a screen in real time. But I do believe it does have its limitations and will not replace a real guitar if you’re serious. Firstly strings on the Jamstik Plus are much finer than on a real guitar. It will help you learn cords but to play guitar you will still have to get some calluses and learn to press much harder for a clear tone. The Jamstik Plus has sensors that detect the placement of your fingers and display them on an App on your smart device. With midi technology and many sound tones available the Jamstik Plus can virtually sound like anything. If you are familiar with Garageband you can effortlessly go through sounds and use the Jamstik Plus as a controller to get a more real feel, a big improvement than tapping on a glass screen. The Jamstik+, comes with a micro USB cable, guitar strap, picks, and printed setup information. The Jamstik Plus charges from a computer or any standard USB charger, providing around 8 hours of use per charge. I think the Jamstik Plus coming in at around $300 could be a little less expensive but it could be a good compact handy tool to use when creating music on your Ipad. As a guy that plays guitar, I could see using this in Garageband as my main controller, using it to play bass parts, drums, and synthesizers. I would play some simple guitar parts like strumming and a simple picking pattern. But if I really wanted to play I would pick up my guitar. If you want to just learn to play guitar I would recommend against the Jamstik Plus. I would buy a real guitar. A great beginner guitar is the Recording King RPH-05 Dirty Thirties Solid Top Single O for less money than the Jamstik Plus. I have one myself and I love it. I think the ideal user is someone that is already creating music using computer music Apps would like a small Midi controller and would like to learn to play guitar. Also some people may find it easier and more compact than playing on a keyboard controller. The Jamstik Plus will get you started on playing the guitar but its main purpose is a Midi controller. Have you always wanted the freedom of going wireless with your guitar but have been discouraged by the price, complicated setup and poor sound quality. The Xvive is a Wireless Guitar system that might fit the bill for you. There are a number of wireless setups on the market some with large battery packs and additional receiver requiring more cables and others use WiFi like the Xvive U2 Wireless Guitar System Review. The Xvive is a simple rechargeable dongle-like devices that you plug one into your guitar and one into your amp or pedal. Turn them on and boom you are wireless.The Xvive Wireless System has four channels options at 2.4Ghz and up to 100 feet line-of-sight. So it will works great onstage. Having 4 channels you can set it so you can transmit and receive with multiple instruments on the same setting, or you can assign multiple receivers to the same channel and use a single transmitter. Broadcasting on the 2.4Ghz band greatly reduces interference caused by TV, stations, public safety broadcasts, cell phone towers, and other high-powered sources. Testing has provided a solid connection with no drop in connection signal and has proven the Xvive U2 Wireless System to be very reliable. The sound difference versus using a cable is very nominal if any. But if you're doing some recording it is still is best to plug in directly with a cable. The great thing about the Xvive is compact size and flexibility that will fit onto any guitar. You won't need a special model based on whether you plug the Xvive U2 into the front of your guitar like a Stratocaster, or as opposed to plugging into the side of your instrument, as you would on a Telecaster. The rechargeable battery feature keeps the ongoing price down no need to buy batteries. A single charge will last 4 to 5 hours of playing time. The Xvive U2 fits all string instruments with a passive pickup, not active pickup. The U2 uses Wi-Fi signal to make the connections. If there is a lot of Wi-Fi signals in your practice area this might cause the signal to pop or click while playing or when using near a computers router signal quality can be hit or miss. When used in low Wi-Fi traffic areas, they work with no issues. A good idea before you buy is to download a Wi-Fi analyzer and check before you buy to see how crowded the Wi-Fi signals are in the area you intend to use the U2s. So if you’re looking to go wireless for a reasonable price the Xvive U2 Guitar Wireless System could be the answer for you. Many positive reviews, great signal range with little to no dropouts. Simple setup with no other wires required. Economical rechargeable batteries keep ongoing costs down. But be sure to have them fully charge before a gig. Great for on stage or just practicing around the house any guitar player would love this toy. I came across this guitar accessory the Hammer Jammer that I believe could help some guitar players with physical difficulties. Players with arthritis, wounded soldiers or other ailments that make fingerpicking difficult. I know myself after cutting a tendon on my thumb it took me years to start playing again. I really missed it. The Hammer Jammer can keep you playing when your fingers are giving you trouble. Helping people with physical difficulty put aside this made in America device allows players to develop incredible speed. The nature of the design lends itself to a more percussive style playing patterns and opens up some great possibilities and ideas. Invented buy studio musician Ken McCaw a piano and guitar player. He wanted to have a percussive sound like a piano, but with a guitar sound. His goal was a percussive slap guitar sound with individual note speed, like a keyboard. When he first was working on the Hammer Jammer years ago, He recieved a lot of encouragement from fellow musicians like Ricky Skaags, Vince Gill, Chet Atkins, Mark O'Connor, Larry Carlton,Eddie Van Halen and many studio players that he encountered when he performed in the studios. .
Ken McCraw used the Hammer Jammer in the movie trailer “Stone of Destiny”, the European version and received a lot of positive feedback for the unique sound. Check the trailer out. You can really hear it at 45 seconds in. As you can see it works really well in the Celtic music style a very percussive sound. It can be mounted on the bridge or further up the neck on both acoustic and electric guitars. How it works is it has six little hammers that you tap with your fingers or palm. This will cause the hammers to strike the string and the string to ring out. It gives a harmonic sound that has a very percussive quality. The Hammer Jammer gives you the ability to easily perform multiple string trills and create unique patterns. With any change in the instrument, a little patience and practice can take your playing in a new fresh direction. I think you need to practice and experiment with it like anything else to get the most out of it. But if you're just starting to learn to play guitar stick with the basics for now and maybe in the future you can look into the Hammer Jammer. The construction of the Hammer Jammer has two main pieces the bracket made from metal and mounted on top and the main unit made from plastic with hammers on the end. They give you two sets of hammer pads, in pink (softer) and purple (harder) that can be switch very easily. Some complaints on the colour choice. Not big fans of hot pink on their guitar. There are a few steps for installation mounting the main bracket and aligning the hammers with the strings. See the video above for complete steps for electric and acoustic guitars. This unit works best with an experienced guitar player that is looking to create a more percussive sound in their playing style. Not for everyone but for some it could be a nice addition to spark some creativity. As for disabled people I could see this getting them playing again in a new way. Don’t forget Django Reinhardt only played with two fingers and created his own technic. The Audio-Technica ATH-M50x headphones are one of the best headphones on the market for the money. The ATH-M50s are priced at around $150 and will perform as good as headphones costing $1000. Recommended by a studio mastering engineer friend of mine, I bought a pair and was not disappointed. They fit very comfortable and have excellent sound quality. The sound is not an overhyped sound but a flat response to let the true sound come through. Good sound isolation. A guitar player can use headphones when practising late at night or jamming with Garageband on a Mac. The removable cable is a new handy addition to the ATH-M50x with the twist and lock mechanism you can easily change the cable in seconds. Use the longer cable when record vocals or moving around the office and need a longer cable. For a more manageable length use the 1.2 meter cable or the classic coiled cable. I feel they should have included a shorted cable as the 1.2 meter cable is still a little long for your average smart phone user. See my full review to learn more about the ATH-M50x Audio Technica. An acoustic guitar is made from wood and wood can be affected by the surrounding moisture in the air. Living in Canada, we have extremes of weather in the summer we may have hot, humid weather, and in the winter we have dry cold weather. This weather can affect the sound of a guitar and in some cases damage a guitar. For example, I have an acoustic guitar that gets a crack on the top of the guitar in winter, and the summer months it is gone. The Oasis OH-5 Plus Guitar Humidifier is the same size as the original Blue Oasis, and it has 50% greater humidity output, it is an inexpensive gadget that may save your favourite guitar from cracking if you live in a dry desert state or frigid, dry north. Oasis should be used when the surrounding room humidity is between 25-40%. Above 40%, you don't need to use an instrument humidifier. It is essential also to monitor the humidity inside your instrument case. The Oasis is a small device that measures 2 X 6 inches and just sits in the guitar as shown in the picture above. You will need to refill the Oasis OH-5 Plus Guitar Humidifier about once a week. The refilling process is straightforward. You can purchase a Guitar Humidifier a kit from Amazon for under ten dollars. If you are a beginner. Music teacher Naomi Wilson has written a great post The ultimate beginner's guide to learning the guitar! This article will teach you a number of basic guitar information to get you started on the right foot.